New and improved online tool helps customers find the right incontinence products from more than 660 choices, saving time, money and frustration, according to Lynn Wilson, Founder of The CareGiver Partnership. The CareGiver Partnership's new and improved tool sorts through hundreds of products to find the right one. We’re providing caregivers with tools to help avoid the costly mistake of buying incontinence products that don’t meet their needs. Customers buying incontinence products for the first time waste an average of $130 trying products before finding what they need. But a new and improved, easy-to-use online tool changes all that, says Lynn Wilson, Founder of The CareGiver Partnership, a national retailer of incontinence supplies and other home health care products. 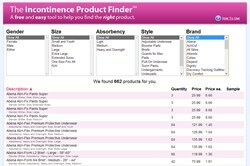 Using the new and improved Incontinence Product Finder, customers easily can sort through more than 660 products in seconds. Products can be narrowed down by gender, size, absorbency, style and brand. By selecting a product on the resulting list, a customer can see features, quantity, price and whether a sample is available without leaving the page. Like all areas of The CareGiver Partnership’s Web site, this innovative new tool is designed with the senior shopper in mind. User-friendly features include a new, easy-to-understand section explaining incontinence product styles, accessible via an easy-to-find link from the Incontinence Product Finder page. At the bottom of the Incontinence Product Styles page, shoppers have one-click access to the finder tool, frequently asked questions, sample service and information on how to become a product tester. The new and improved Incontinence Product Finder makes use of the latest software from Google called Angular JS. The result is a significantly faster connection by the consumer to the data stored in the Incontinence Product Finder. Moreover, the logic behind this unique tool makes the Incontinence Product Finder smoother, faster and more useful. The end result for customers is helping them better determine the best incontinence product choices and reducing their chances of buying products that do not meet their needs. The CareGiver Partnership is a national direct-to-consumer retailer of home healthcare products for incontinence, diabetes, nutrition support and more. In its seventh year of providing products and services that help caregivers and loved ones maintain personal dignity, the company also offers an online library of more than 1,400 family caregiver resources and personal service by experts in caregiving. Call 1-800-985-1353 or visit online at http://www.caregiverpartnership.com.